After the fight, Williams was asked to leave the reunion taping, while Moore was allowed to return. 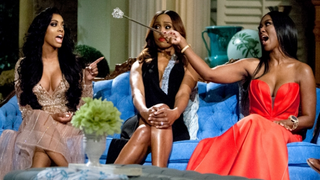 As viewers anticipate part 2 of the RHOA reunion on Sunday, rumors abound that Williams will not be returning to the show for breaking an alleged Bravo anti-fighting policy—which I had never heard of before this brawl and don’t believe exists, given the number of fights that have happened on the network’s other shows. If Williams goes, so should Moore. No matter who stays or leaves, Bravo would do well to rethink its portrayals of black women and keep its cast members safe. Perhaps there’s hope. Bravo head honcho Cohen initially tweeted that “a bullhorn didn’t equate to violence to me,” but after significant push-back from viewers, he announced that props would be banned from reunion shows. That’s a start. Demetria L. Lucas is a contributing editor at The Root, a life coach and the author of A Belle in Brooklyn: The Go-to Girl for Advice on Living Your Best Single Life and the upcoming Don’t Waste Your Pretty: The Go-to Guide for Making Smarter Decisions in Life & Love. Follow her on Twitter.